Amazon Neptune, a new fully-managed cloud graph database, is generally available after its limited preview launch last year. 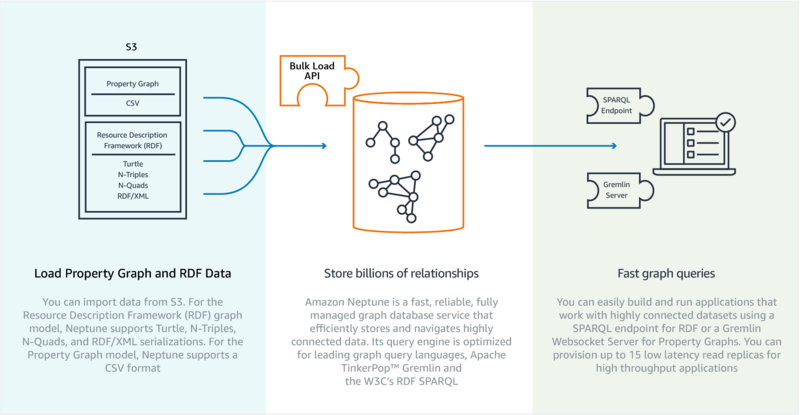 With Amazon Neptune, customers can manage data within a graph model – a semantic structure in nodes, edges, and properties. AWS will manage the operational aspects of the Amazon Neptune graph database within their cloud platform, and therefore customers will not have to perform operations like maintenance, patching, backups, and restores. Furthermore, the service is highly available, with read replicas, point-in-time recovery, continuous backup to Amazon S3, replication across Availability Zones (AZ), and supports encryption of data at rest and in transit. As the world has become more connected, applications that navigate large, connected data sets are increasingly more critical for customers. We are delighted to give customers a high-performance graph database service that enables developers to query billions of relationships in milliseconds using standard APIs, making it easy to build and run applications that work with highly connected data sets. We look forward to using Amazon Neptune as an integral part of our data platform. Neptune will allow us to connect the dots between genomics, pathology, neurochemistry, device and patient clinical data, efficiently and at scale, helping us drive breakthrough discoveries. This research also makes me wonder why AWS decided to deploy Neptune instead of extending DynamoDB. With that in mind, it would not surprise me to wake up one day to find Neptune absorbs DynamoDB. After all, Cosmos DB absorbed DocumentDB last year. The Amazon Neptune is currently available in the US East (N. Virginia), US East (Ohio), US West (Oregon), and EU (Ireland) regions and Amazon are planning to expand to additional regions in the coming year. Furthermore, the pricing detail of AWS Neptune is available on the pricing page.